The Pro Grade Jumbo Storage Cabinet can hold up to 600lbs. and comes equipped with four shelves, three adjustable and one fixed, that hold up to 150lbs each. The locking Armadillo tread pattern doors with integrated metal handles provide added security for anything you choice to store. With it’s easy to assemble expandable technology, you’ll spend less time assembling and more time organizing. Armadillo storage cabinets were created with the understanding that your time is valuable, so we made the assembly simple. While the assembly of your new Armadillo cabinets may be easy, every cabinet we design is constructed with the same high-grade steel and durable finishes found on some of the more expensive brands. We are so confident in our products that we offer a limited lifetime warranty. Folded: 66.1 x 36 x 39.4in. Open: 36 x 18.1 x 72in. To clean wipe with a damp cloth and dry immediately. Maximum shelf weight limit is 150 lbs. (68 kg) for each shelf. Maximum weight limit is 600 lbs. (272 kg) for the cabinet. This product is intended for indoor use only. Heavy-duty 5 casters increase this unit’s stability. Front casters lock, making it possible to hold the unit in place while swiveling rear casters make the unit easy to move. The Jumbo Storage Cabinet stands over five feet tall and can hold up to 600lbs. Equipped with four shelves, three adjustable and one fixed, that hold up to 150lbs each. Locking doors with clean recessed handles provide added security for anything you choice to store. Keep your hazardous cleaning products and things you want out of reach, stored away in these durable and secure Wall Cabinets. The locking doors with clean recessed handles provide added security for anything you choice to store. With our easy to mount installation guide you will have these units up and your items organized in no time! The Multi-Function Cabinet offers organizational flexibility with one drawer and two doors. The drawer can hold up to 50lbs while riding on jam free full-extension runners while the locking doors open to a large storage cabinet with an adjustable shelf that can be removed when additional space is needed for larger items. This six drawer cabinet is ideal for storing all your handheld tools. All six locking drawers can hold up to 50lbs each while running on jam free full-extension runners. Steel walls provide added strength and durability. Solid wood counter top allows you the perfect surface for all your projects, big or small. 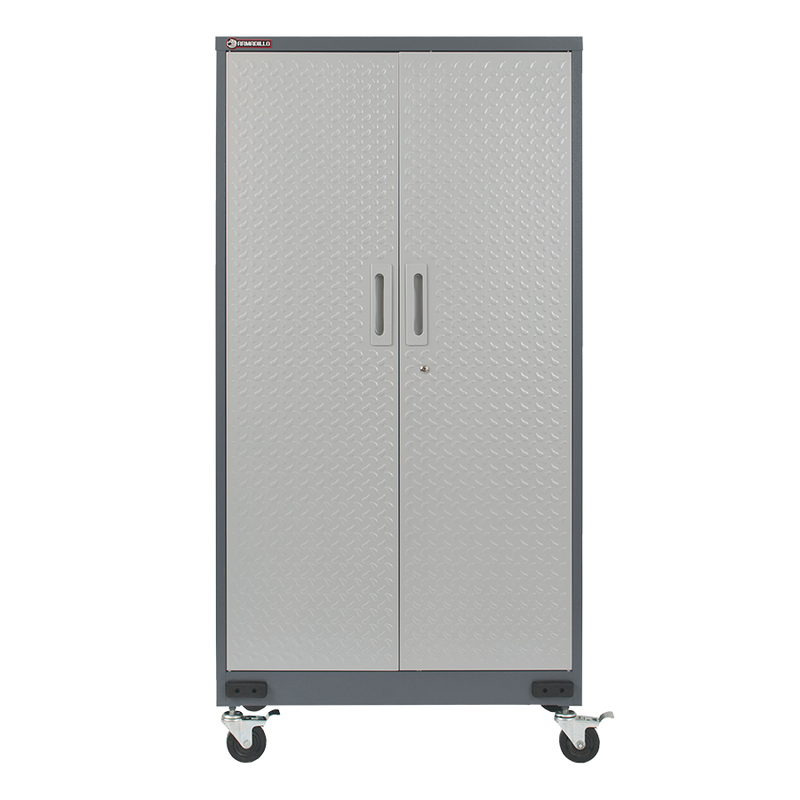 The Performance Jumbo Storage Cabinet can hold up to 600lbs. and comes equipped with four shelves, three adjustable and one fixed, that hold up to 150lbs each. The locking Armadillo tread pattern doors with integrated metal handles provide added security for anything you choice to store. The Multi-Function Cabinet offers organizational flexibility with one drawer and two doors. The drawer can hold up to 50lbs while riding on jam free full-extension runners while the Armadillo tread pattern locking doors open to a large storage cabinet with an adjustable shelf that can be removed when additional space is needed for larger items. The Performance six drawer cabinet is ideal for storing all your handheld tools. All six locking drawers with the Armadillo tread pattern can hold up to 50lbs each while running on jam free full-extension runners. Steel walls provide added strength and durability. Solid wood counter top allows you the perfect surface for all your projects, big or small. Keep your hazardous cleaning products and things you want out of reach, stored away in these durable and secure Wall Cabinets. The locking Armadillo tread pattern doors with integrated metal handles provide added security for anything you choice to store. With our easy to mount installation guide you will have these units up and your items organized in no time!